Ideas for our quilting friends. Want to have a great time sewing on your project plus spend time with your friends who sew? Sew Satisfying is for you! This is an "open sew" class. Bring your machine (or not, if you're hand sewing), your supplies, project(s), and of course yourself, and sit and sew for a few hours. 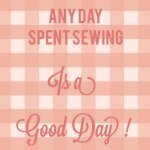 Count 'em - 7 hours of non-stop sewing that you can schedule for yourself! What a treat!